I’m the type of techie who is hard to impress at times. Sure, I find innovation just as interesting as the next guy. The only problem is that I’m a stickler for practicality. If I feel that a new device isn’t exactly practical or useful, I won’t waste my time or money on it. Recently I’ve been seeing a lot of people resorting to tablets as their main mobile computing source. Now call me old fashioned, but I love my MacBook Pro. I’m a laptop kind of guy. All the power of a computer with the added mobility. Companies like Microsoft have taken notice of the battle going on between laptops and tablets, and have since decided to make a compromise between the two. We’ve all seen the Microsoft Surface Pro. It’s the tablet-laptop hybrid that seems to keep laptop users in mind while moving on with the tablet generation. The goal is to give you the best of both worlds. This is something that I can accept. 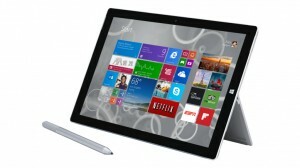 The most recent iteration is Microsoft’s Surface Pro 3 has come out less than a year after the Surface Pro 2. The Surface Pro 2 made its way out of the gate with some positive reception. The only drawback of the device itself was that it didn’t really gain too much headway on the market. The concept of this design is actually quite ingenious. You have your tablet, and should you want to have a bit more accuracy with your typing, or want more screen space and responsiveness, you have the attachable keyboard. All you need do is fold down the tablet against the keyboard attachment and eureka! You essentially have a laptop. It’s a really smart concept I feel. The only problem is that so many people still choose Apple products over Microsoft products. That is not to say that Microsoft is struggling, because they most certainly aren’t. Having said that, so many more people own iPads over Microsoft tablets. Now whether this be a popularity contest or not (I feel that it is), it still puts a damper on Microsoft’s product sales. Even though more people own iPads, over 95% of those people who own iPads own laptops as well. That would suggest that the tablet either isn’t powerful enough to perform some of the functions that consumers need, or they may feel that they don’t get the same type of responsiveness from a tablet as they would from a regular laptop. One Panos Panay, the corporate VP of Microsoft, was quoted saying that “Tablets are designed for you to sit back, watch movies, browse the web, and snack on apps. Laptops are designed for you to do something.” To be completely honest, I couldn’t agree with him more. The simple fact is this; tablets have less room for the inner workings of a computer than a laptop does. The screen is completely separate from the “computer” part of the laptop, where as the tablet is one whole device. Since there is more room in a laptop, my bet is on the laptop for more power and productivity. Even with these types of facts laid out, I don’t think that the idea of having a laptop-tablet is necessarily a bad idea. I just feel that we won’t be seeing that particular technology pushing through the ranks anytime soon. I think it’s gonna be a while before the laptop steps down, especially for a hybrid. certainly like what you’re stating and the way in which during which you assert it.